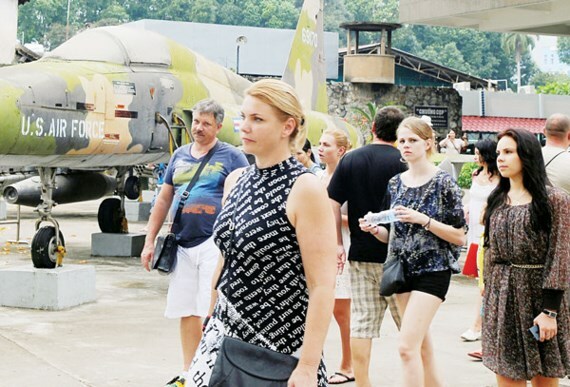 The Ho Chi Minh City People’s Council yesterday had a working to survey ideas for the city's tourism development in connection with museums. At the working, leaders of departments, agencies and museums in the City had a general idea for creating more advantaged conditions so that the museum becomes attractive destination for domestic and foreign tourists. Currently, the city has eight museums including Ho Chi Minh City Museum in the city, History Museum, War Remnants Museum, Museum of Fine Arts, Ton Duc Thang Museum, Museum of Aodai, and Southern Vietnam Women Museum. Director of War Remnants Museum Ms. Huynh Ngoc Van suggested the city’s tourism industry needs to exploit tour in line with learning about Vietnam’s history. In fact, Cu Chi Tunnel and War Remnants Museum always attract a huge of arrivals. Deputy Director of Ho Chi Minh City Culture and Sport Department Mr. Nguyen Van Minh said that the department submitted the city People’s Committee for ticket price. Accordingly, the ticket is expected to cost VND 30,000 per person. Some museums plan to operate 24 hours to serve tourists starting June 1, 2017.